A new conference organized by former U.S. Capitol Historical Society Fellow, Prof. Todd Larkin of Montana State University, will examine political portraiture in the United States and France, 1776 to 1814. The conference will be held September 25-26 in the Nan Tucker McEvoy Auditorium of the Smithsonian’s National Portrait Gallery. 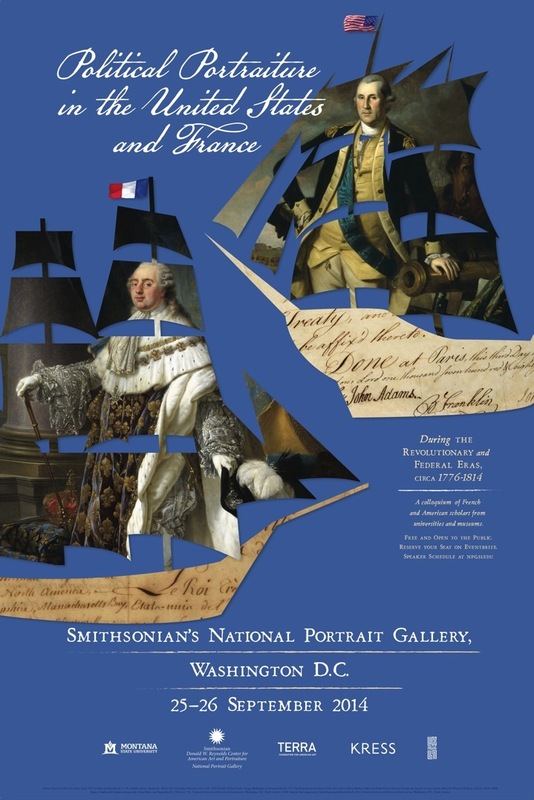 The Montana State University Foundation and the Smithsonian’s National Portrait Gallery invite scholars, students, connoisseurs, and friends of American-French cultural exchange to attend the conference, which will mark the bicentennial of an important historical event: the British capture of Washington, D.C., in 1814 and their burning of the Capitol along with Congress’s state portraits of Louis XVI and Marie-Antoinette. European and North American scholars from universities and museums will discuss aspects of diplomatic strategy, democratic representation, and republican identity as promoted in portraits. This conference is made possible by generous support from the Terra Foundation for American Art, the Samuel H. Kress Foundation, and the Henry Luce Foundation. The flag of the United States was unfurled from the statue and at that moment a photographer took a picture of the event from the west front side of the Capitol. 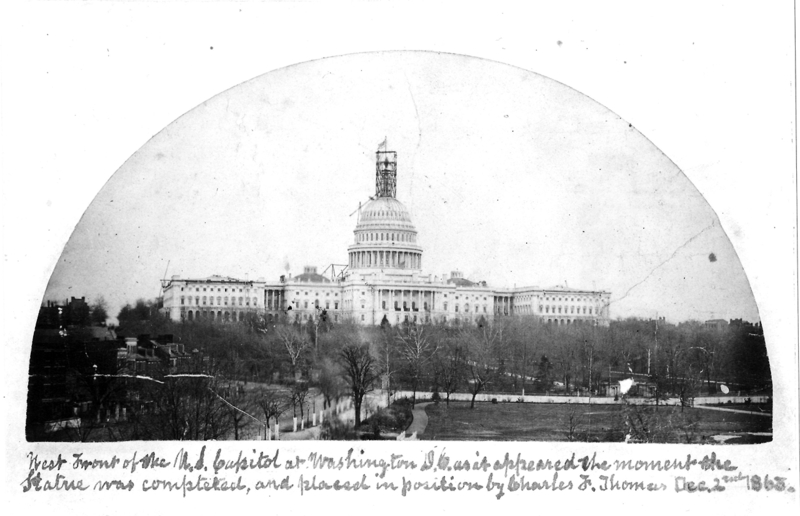 A copy of that photograph, preserved in the collections of Charles F. Thomas, the engineer who supervised the installation, is shown here courtesy of the Architect of the Capitol, whose Flickr feed includes a high resolution image of the photograph. The most recent issue of the Capitol Dome magazine has an interesting article by Katya Miller on the productive friendship between Thomas Crawford and Sen. Charles Sumner that culminated in the creation of the sculptor’s masterpiece. You can find the article online here. The halls of the Capitol’s Senate wing are slowly becoming bright and vivid. It is only because of the recent restoration that Brumidi’s intricate frescoes are coming back to their original glorious state. In a recent visit to the Capitol, I was lucky enough to speak with one of the experts restoring the Brumidi Corridors of the Capitol. He explained how the ten-year restoration project plans to uncover the masterful art lost under layers of paint. The specialist also explained the process through which they are to achieve their goals. It is through careful scraping with a scalpel and occasional use of solvents that the highly-skilled workers are able to dig through time and uncover Brumidi’s hidden treasures. 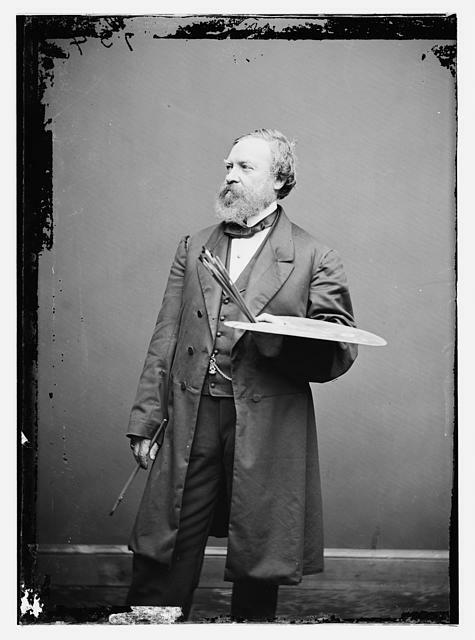 From 1857 to 1859, Constantino Brumidi, “The Michelangelo of the United States Capitol,” filled the walls and ceilings of the corridor with visually striking images. Birds, flowers, fruits, insects, classical figures, and historical scenes were brought to life with a three-dimensional quality lost up until the restoration. Brumidi’s main source of success was his mastery of various styles and techniques. An immigrant from Italy, Brumidi was among the most skilled classically trained painters in the United States at the time. After he painted a trial fresco in 1855, Brumidi and his dedicated team of artist-apprentices began the gorgeous span of frescoes that is currently being uncovered. Over the years, dirt and hallway traffic took its toll on these lovely works. Without knowledge of proper restoration, coat after coat of paint covered the formerly brilliant colors with darker shades and varnish that turned an unpleasant shade of yellow over time. The differences in color, luster, and design are striking. Small portions of sample restorations show the incremental changes to the art over time. In some instances, certain designs and details were completely painted over, as if their importance was not much realized. Up to eight layers of paint build-up have been carefully scraped away to expose original designs and colors. Altogether, the project has combined full and partial restoration with expert replications based on original descriptions of the work. One can expect that brighter hues, faux marble motifs, and interesting techniques unique to Brumidi will continue to emerge. 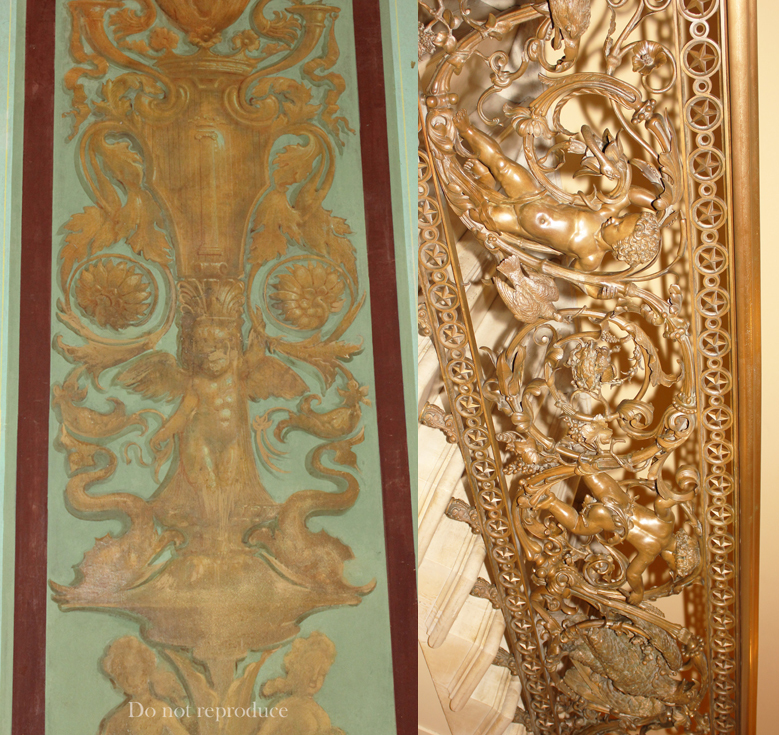 The ambitious and meticulous task of restoring these great works will have an inarguably positive impact. Future generations will have the opportunity to view our nation’s hub of democracy in its original glory and Constantino Brumidi’s beautiful paintings may be enjoyed for years to come. 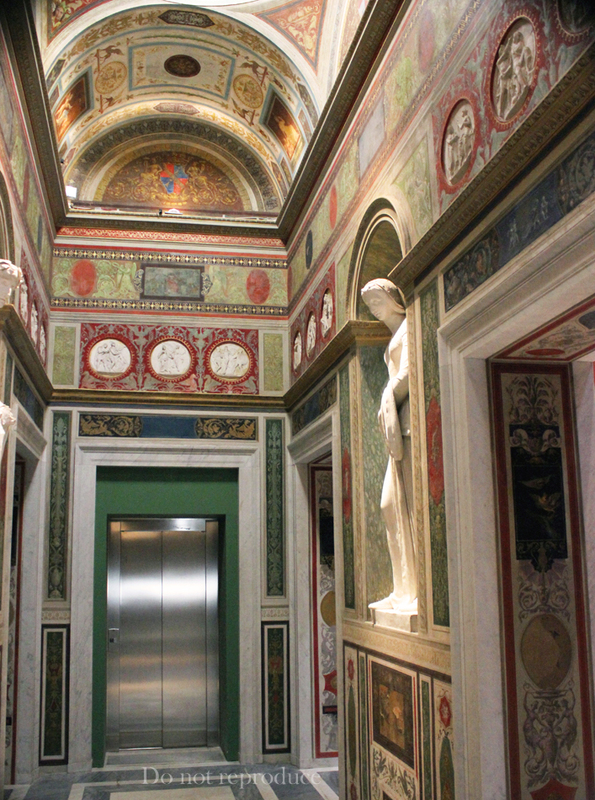 “About AOC.” Brumidi Corridors Restoration. N.p., n.d. Web. 18 July 2013. 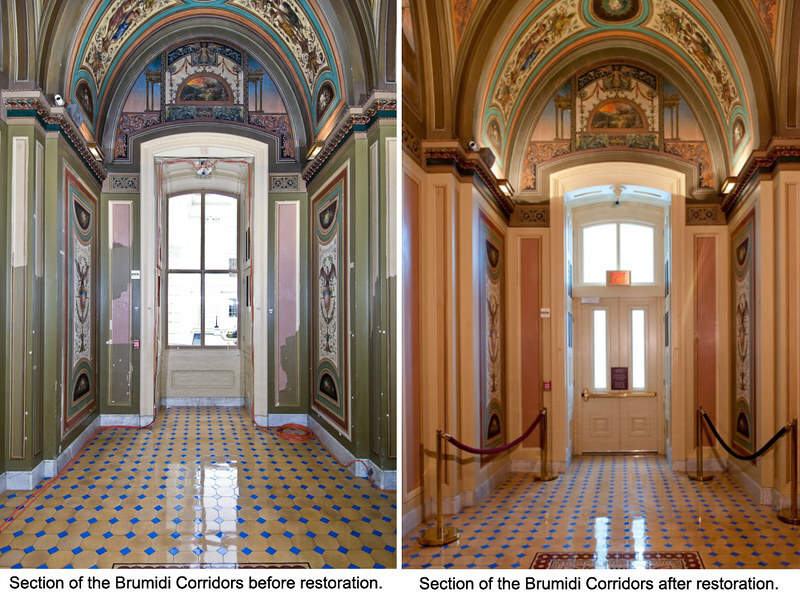 <http://www.aoc.gov/brumidi-corridors-restoration&gt;. Applewhite, J. Scott. “Bright Art Being Restored in Capitol’s Halls.” Bright Art Being Restored in Capitol’s Halls – USATODAY.com. USA Today, 20 July 2007. Web. 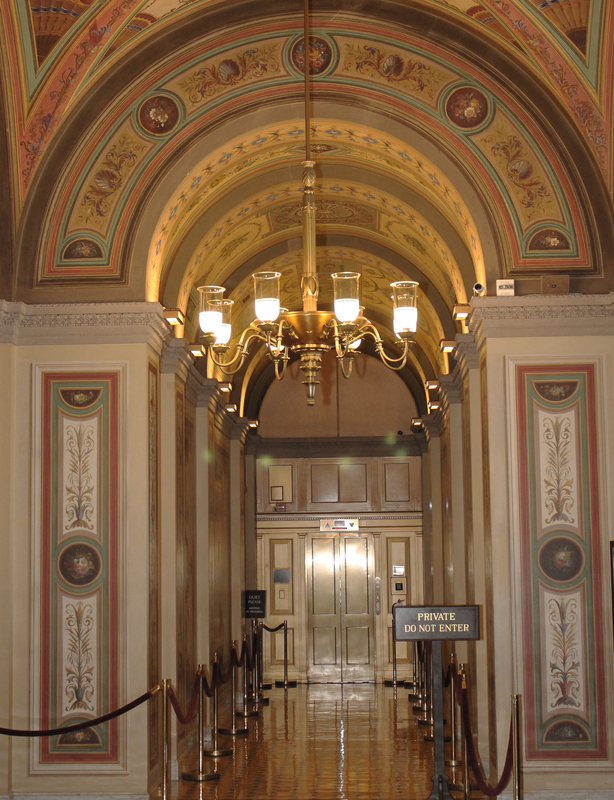 <http://usatoday30.usatoday.com/news/washington/2007-07-20-brumidi-corridors_N.htm?csp=34&gt;. “Explore Capitol Hill.” Constantino Brumidi. Architect of the Capitol, n.d. Web. 18 July 2013. <http://www.aoc.gov/constantino-brumidi&gt;. The United States has its fair share of celebrated history, yet like every other country, it also has its history of grave wrongdoings. For the United States, a major portion of this abhorrent history occurred during the 18th and 19th centuries in the form of chattel slavery. However, rather than try to hide from the mistakes of past Americans, slavery has become very much an integral part of our history. It may not shine a favorable light on the United States, but slavery’s impact in our contemporary world is seen in literature, music, art, architecture, and academia, amongst other things. And through these areas of cultural impact, influential black leaders continue to emerge, permanently impacting U.S. history. I bring up slavery and history because one day my mom asked me a question about my research on the statues in the Capitol: “How many African Americans are represented by statues?” At the time I was unsure, but I went on to research her question and noticed a pretty substantial disparity. What I found was astounding: out of the 100 statues in the National Statuary Hall Collection, none represented an African American. There are four African Americans that are represented in sculpture in the Capitol, three of which were sent by Congress and the other that was voted for by a district with no congressional representative. Congress commissioned a statue of Rosa Parks and busts of Martin Luther King Jr. and Sojourner Truth. The District of Colombia recently contributed a statue of Frederick Douglass, a selection that garnered some controversy because D.C. is not a state, and therefore the statue is not a part of the National Statuary Hall Collection. For the number of influential black leaders in the history of the United States, this hardly seems like equal representation. 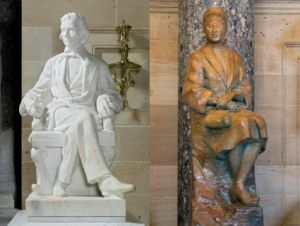 Alexander Stephens (left) and Rosa Parks as they appear in the Capitol. The question I am thankful my mom didn’t ask me was, “How many Confederates are represented in the Capitol?” If she did, I would have told her that there are several Confederate military and political leaders represented and countless other figures who supported slavery. Included are both the President and Vice President of the Confederacy, Jefferson Davis of Mississippi and Alexander Hamilton Stephens of Georgia. Legislation from 1864 states that each state is allowed to send two statues of “illustrious citizens deemed worthy of national commemoration” to represent their state in the National Statuary Hall Collection, but that the decision is up to them. At the time, many of the “illustrious citizens” from the southern states were Confederates and slave holders. You cannot fault the person for being posthumously selected to be represented by a statue, but rather wonder today why they still stand. Since 1864, more prominent citizens have emerged and because of this, states have lobbied Congress to let them change their statues. Congress acknowledged this request and in 2003 passed a law which made it possible for states to replace existing statues. Despite this new law, states have replaced white males with white males; the only exception is Helen Keller from Alabama, who replaced J.L.M. Curry, a high ranking Confederate soldier. Alabama’s other statue, however, is General Joseph Wheeler, another Confederate soldier. Many look to the 13th Amendment, the end of slavery in the United States, as the mark of freedom for African Americans. Then there are those that argue that political equality for African Americans was not attained until the 1965 Voting Rights Act. And even then, people might say that complete social and economic equality still does not exist today. Looking at the underrepresentation of African Americans and the overrepresentation of those denying their rights in National Statuary Hall, you could very well make this claim. The absence of African Americans in National Statuary Hall does not show that states are overtly racist and it most certainly does not show that this country lacks illustrious black citizens. What it does do is remind us that although our country has made serious strides in equal rights and representation, we must continue to work toward a more perfect union. Teresa B. Lachin, “Worthy of National Commemoration: National Statuary Hall and the Heroic Ideal, 1864-1997” in The United States Capitol: Designing and Decorating a National Icon, ed. by Donald R. Kennon (Athens: Ohio University Press, 2000), 274. More for more information about the artwork in the Capitol, visit the websites of the Architect of the Capitol, the Senate History office, or the House Office of the Historian/Office of Art and Archives. 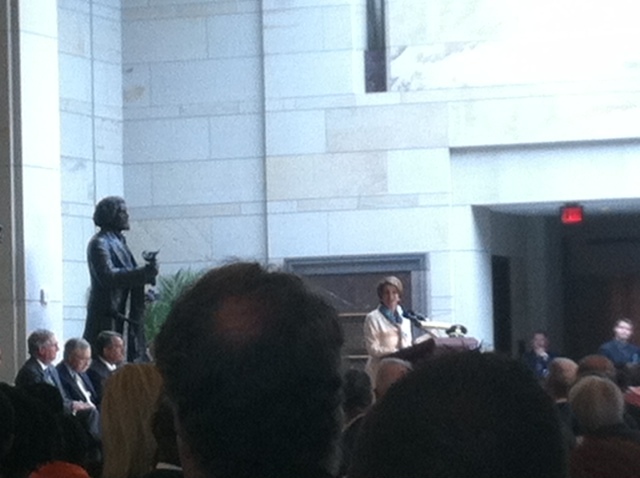 Spirits were high on Wednesday, June 19 at the Capitol Visitor Center, when Washington, D.C.’s first statue was unveiled in Emancipation Hall. This day commemorates the abolition of slavery in Texas on a day known as Juneteenth. Frederick Douglass has officially joined the Capitol’s Congressional Statue Collection, serving not only as D.C.’s first statue in the collection, but also as a vital addition to the Capitol’s African American sculptures, joining the ranks of Dr. Martin Luther King, Sojourner Truth, and Rosa Parks. The arrival of his statue also welcomes the possibility for other US territories to argue for sculptural presence in the Capitol as well. Legislation was sponsored by the Honorable Eleanor Holmes Norton (DC) in the House and the Honorable Chuck Schumer (NY) in the Senate, and both were in attendance with inspiring remarks at Wednesday’s ceremony. There is no doubt that Douglass’ presence will do DC residents proud, along with the thousands of other tourists who visit our nation’s Capitol each year. Born into slavery in Talbot County, Maryland, Douglass escaped to freedom and went on to become one of the most important figures in history to fight for civil rights. He fought for freedom throughout his life for both African-Americans and women, from equal voting rights to anti-lynching laws, and eventually made Washington D.C. his home. 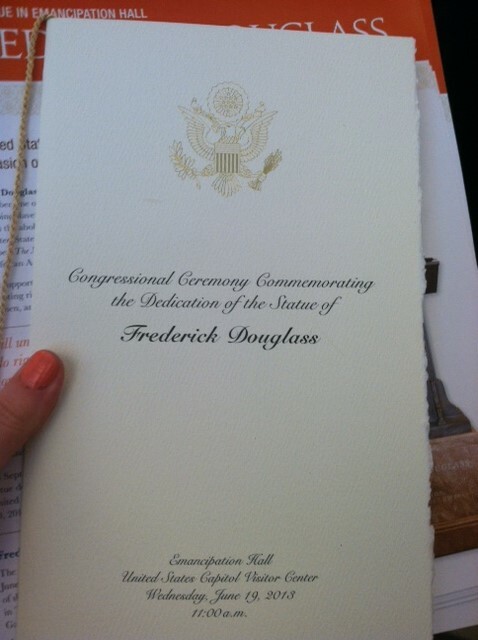 Douglass’ impact as a champion of civil rights is still felt today and was apparent during the unveiling ceremony. In addition to the dignitaries mentioned previously, some famous names and faces participated: Dr. Edna Greene Medford, current chair of Howard University’s Department of History; Congresswoman Nancy Pelosi (CA); Senator Mitch McConnell (KY); Senate Majority Leader Harry Reid (NV); Speaker of the House John Boehner (OH); and Vice President Joe Biden. Seeing such illustrious figures speak about Douglass was certainly a thrill, but a different excitement came when a representative from Douglass’ family got up to deliver a word of thanks. Nettie Washington Douglass is a descendent of both Frederick Douglass and his peer (and rival), Booker T. Washington. Hearing her talk about her family’s history and background was like watching a piece of history come to life in front of us. The event was highlighted with beautiful musical selections: the United States Army Brass Quartet’s selections and the United States Army Chorus’s rendition of “The Battle Hymn of the Republic” helped set the backdrop of the Civil War. Lori Williams’ version of the freedom song “Oh, Freedom” (also performed by Joan Baez at the March on Washington in 1963—50th anniversary coming up in August!) was absolutely stirring. We could see the reaction on all the attendee’s faces—Vice President Biden himself was awestruck. It was a great vision of how far we’ve come—as a country—since Douglass’ lifetime, and a reminder of how far we still have to go. For more information, please visit the Architect of the Capitol’s page on the Douglass statue. Two years ago I wandered past Rome’s Villa Torlonia – the neo-classical palace on the Via Nomentana – that struck my memory more because it was the residence of Italian dictator Benito Mussolini than for any other reason. Another thought crept in: Hadn’t Constantino Brumidi painted some murals somewhere in the impressive villa in its idyllic park setting? I quickly scribbled a note in my journal to check into it and wandered along about my business. A few days later (and after a little research) I made my way back and toured the palace. I asked a young man working in a small bookstore about the Brumidi murals in the teatro (theater.) Imagine my surprise – especially given the weight we ascribe to Brumidi in the Capitol building – when the young man said he’d never heard of him and had no information. Instead, he pointed to a fenced off building in the southwest corner of the property and told me it was closed to the public. Alternately puzzled and amused, I wandered away making a mental note to dig into it a little more closely when I wasn’t as pressed for time. Fast forward two years and a handful of email exchanges in Italian. Despite some minor irritations on the American side of the Atlantic, I happily secured permission to view and photograph Brumidi’s murals in the teatro. Arriving at Villa Torlonia, I was met by Rome’s Superintendent of Cultural Heritage and the official in charge of Villa Torlonia, Annapaola Agati, at the palace’s limonaia – originally a greenhouse for citrus fruits that Mussolini also used as a movie theater. In short order, we were in the newly refurbished theater. After almost half a century of decline and neglect, it recently completed a nine-year, 8 million Euro restoration project to return it to its original grandeur. With my first glimpse came the realization the two-year wait was worth every minute. Immediately I felt as though I were in some type of time warp and had been transported back to the very familiar Brumidi corridors of U.S. Capitol. The various rooms and hallways of the west apartment directly showed his handiwork. Familiar door and wall panels greeted me. The style is nearly identical to the Senate corridors. As in the corridors of their Senate cousins, Villa Torlonia’s art depicts densely intricate lattice work, animals, figures, birds, flora, fauna and perhaps Brumidi’s most endearing subject – cherubs. Though not appearing to be as refined as the artwork in the Capitol building, it clearly belongs to Brumidi. A small panel bears his signature “Brumidi 1844” – placing him in this spot roughly a dozen years before he painted in the Capitol. I admit wondering if I were being prejudiced in favor of the Capitol or whether Brumidi’s ability undoubtedly improved over time. I still haven’t decided definitively. High above the semicircular stage are 12 maidens and Apollo – seemingly exact replicas of those found in the Senate Appropriations committee room (which ironically were most likely painted before those in Rome.) 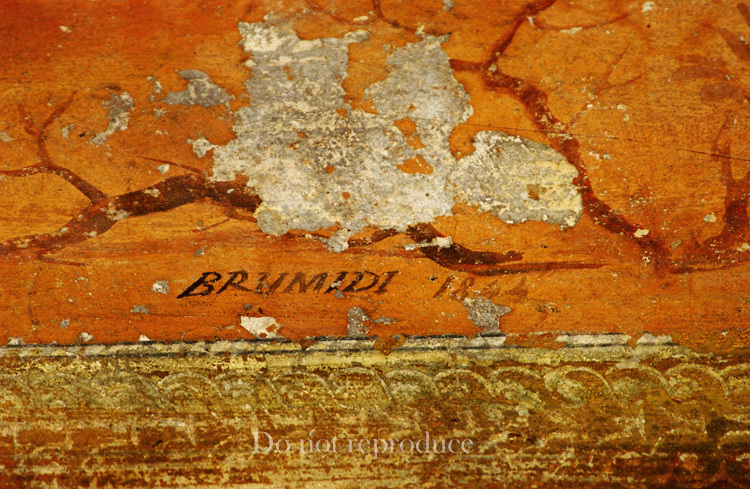 Evidence of Brumidi’s handiwork? Perhaps. Perhaps not. Agati pointed out the while the maidens in both places where Brumidi painted suggest he was at the least involved in planning the art at Villa Torlonia, he left for America in 1852 prior to them actually being painted. The theater wasn’t completed until 1874. 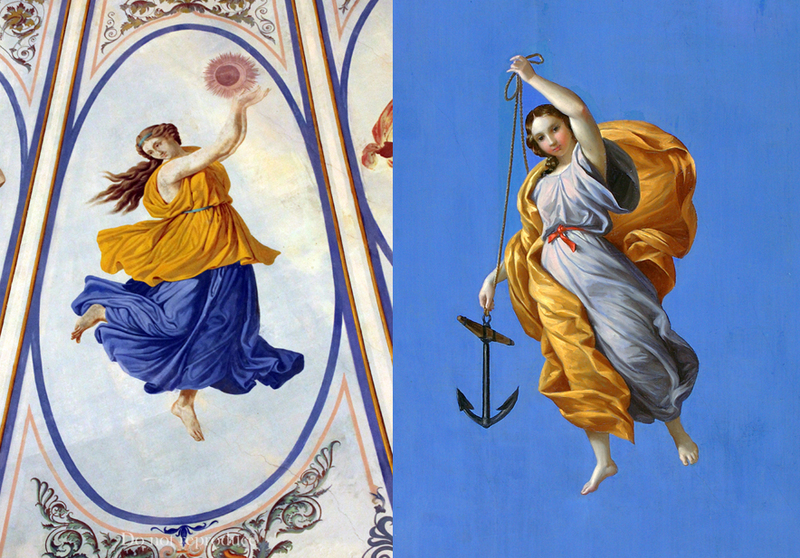 Though his influence is evident, the similarities are more likely because they are based on Raphael’s Hours of Day and Night. With apologies to my friend Joe Grano, I couldn’t resist asking whether the oft-made comparison with Michelangelo is fair. “No,” Agati said, pointing out Michelangelo is much more important for the pictorial quality of his paintings, and because it was an example and a model that has caught on. The principle difference is the media used. Brumidi, Agati pointed out, worked in oil and tempera in Villa Torlonia as compared to his largely fresco work in the Capitol building. For me, the most natural question is whether Brumidi is truly a master artist, or more of a contract painter who replicated his earlier works with some modification – given their astonishing similarities. Perhaps the largest and most striking similarity between art in the Capitol and Rome is Brumidi’s most famous work The Apotheosis of Washington, which bears a remarkable resemblance to the oculus of the small dome at Madonna dell’Archetto (Our Lady of the Arch.) An earlier blog entry shows images of the small chapel’s dome and it is easy to compare the two thematically. “I think Brumidi can rightly be called a ‘master’ because in America he taught a new way of painting that they (previously) did not know,” Agati said. 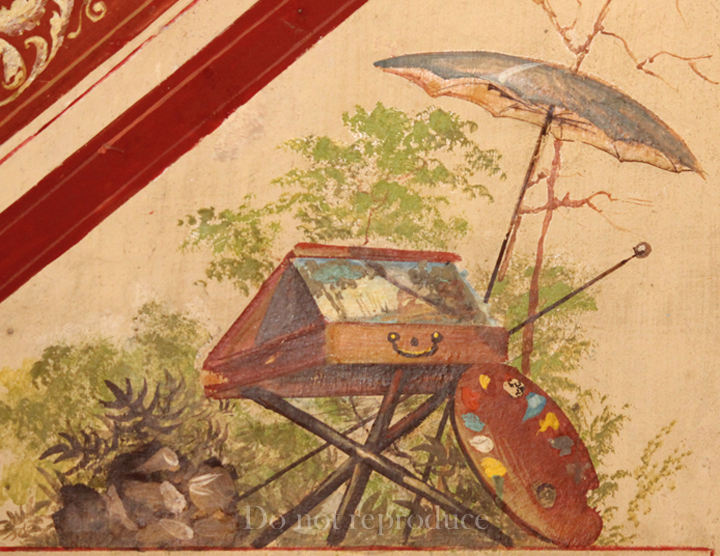 One day, when the restoration of the small theater of Villa Torlonia in Rome is finally concluded, curious visitors with a keen sense of observation might run into a cycle of frescoes whose author, Brumidi, is totally unknown. Apart from specialists, few have had the good fortune to even encounter his name. Who was he? A first answer might be: the one who planned and executed the decoration of the apartments attached to the theater. It is certain that the vault and the lunettes of the hall in the west apartment and the decorations of the small east gallery and apartment are all the work of the artist born in Rome, of a Greek father. To view more of the images from Villa Torlonia, please click here. The author and the U.S. Capitol Historical Society gratefully express our appreciation to Umberto Broccoli, Superintendent of Culture, Capital of Rome, and Annapaola Agati for their kind permission and assistance. All photos of Villa Torlonia were taken by the author, courtesy of the Sovrintendenza Capitolina Ufficio delle Parchi Storici Comune di Roma, and may not be reproduced.